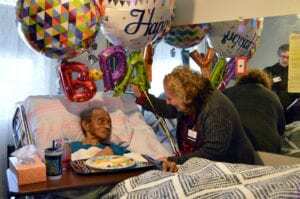 Gainesville resident Arnold Johnson, born on January 18, 1919, recently celebrated his 100th birthday. Haven helped celebrate Mr. Johnson’s life and birthday with balloons and a Legacy Project hand photography session. Gainesville Volunteer Coordinator Susie Finfrock delivers balloons to Arnold Johnson in celebration of his 100th birthday. Mr. Johnson, lovingly referred to as “Uncle Arnie” by family and caregivers, was born in Yonkers, New York. He was a truck driver and also a member of the United States Army. Entering his 100th year of life, Mr. Johnson has still maintained his sense of humor and smile. Mr. Johnson’s family invited Haven into their home for Legacy Project volunteer Joyce Pearson to take photos of their hands together. The Legacy Project is a Haven program that provides free services like life reviews, drawings or photography to help families in their bereavement journey. Juanita said the legacy photos turned out beautifully and that their family will cherish them. They plan to go to a local print shop together to have them printed. The Haven family wishes Mr. Johnson a very happy 100th birthday.